I found the energy of this scene intriguing. 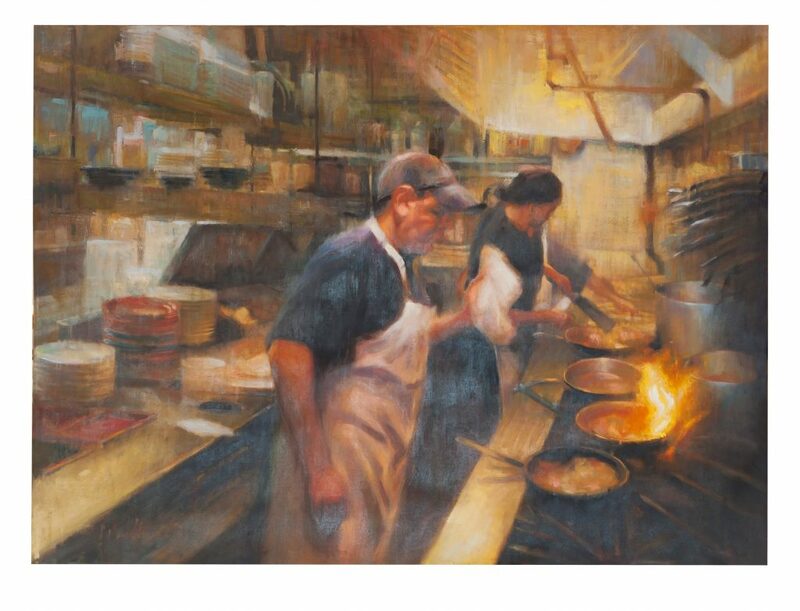 How does one show the action and energy of a working kitchen? I found the manipulation of shapes, edges, and colors worked for me. I wasn’t able to stand right there and paint, so I had to use photos. First thing I did was to flip the image horizontally. This helped me to control the way the viewer entered the painting. It then became about editing what to leave out, or leave in, and how much. Chuck Marshall (Charles W. Marshall, Jr.) Was born in Wilmington, Ohio, on December 7, 1957. The small town of New Antioch,Â aboutÂ 7Â miles outside of Wilmington, became home to Chuck, his one brother, five sisters, mother and father. The surrounding area was known for its agriculture – mainly hogs and com. So Â Chuck grew Â upÂ working Â farmsÂ andÂ spending Â time Â inÂ hisÂ father’s constructionÂ trade,Â but ChuckÂ knew heÂ wantedÂ to do somethingÂ different with his life – he knew he was going to be an artist from a very early age. He would spendÂ hoursÂ eachÂ dayÂ sketchingÂ imagesÂ ofÂ fields,Â hillsides,Â and animals that he would see while roaming the countryside. He studied one year at the Art Institute of Cincinnati before studying at the California Art Institute in Southern California. 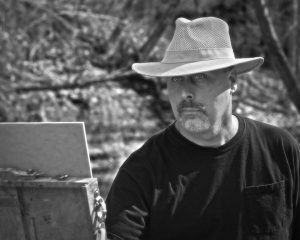 His art career includes many years as an illustrator and graphic designer as well as his fine art. Chuck has been invited to and participated in many national plein air events as a guest artist,Â such as OlmstedÂ Plein AirÂ Invitational, AtlantaÂ Georgia, DoorÂ County,Â Wisconsin,Â andÂ TheÂ Great Â American Â PaintÂ Ou t,Â inÂ the Apalachicola/ Panhandle Florida area.Â Chuck’s Â work Â has Â been publishedÂ Â in Â International Â Artist Â Magazine, American Artist Magazine, and Plein Air Magazine.Â Chuck has won numerous local and national awards, and has also performed as a judge in many juried art shows.Â His work canÂ be seen at the Landing Gallery, Rockland,Â Maine, the Mary Ran Gallery, Cincinnati, Ohio, and Hayley Gallery, New Albany, Ohio.